They Were Preparing Before The Hurricane…But They Spotted This Tiny Kitten IN The Road! Charles and Allie were out buying supplies ahead of the impending hurricane that was predicted to hit their area when a tiny kitten threw a wrench into their plans. The kitten was impossibly small and didn’t really know what to do with herself. She was running around on the road and they were concerned for her safety. She was all alone and there were no other cats around…they knew that if she wasn’t taken to safety before the storm hit, she most likely wouldn’t survive. After picking up the kitten, they drove around tried to find any signs of a mother cat…but no such luck. The hurricane was about to hit, and that meant stores and vets were all closed. They took the kitten home and wrapped her in a warm blanket and gave her a bit of food while they rode out the storm. 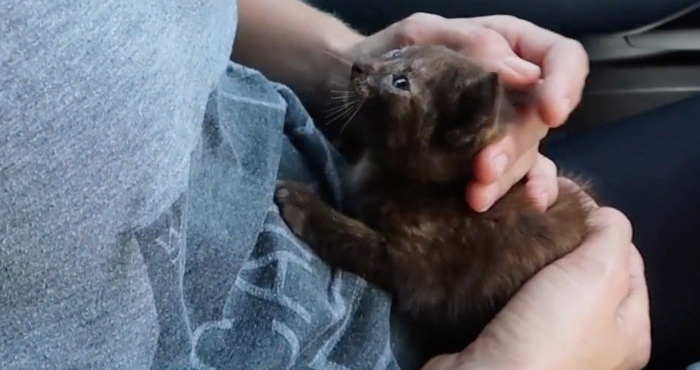 When it passed, they took their kitten to the vet and learned that she was only 4 weeks old! They named her Rica (hurRICAne!) after the circumstances they found her in, and now she is a permanent part of their family! If they had chosen to leave town…they fear that their little kitten wouldn’t have survived if they hadn’t found her!